During eighth grade, students study American History. As an activity to enrich the curriculum, students are offered the opportunity to attend Washington DC as an eighth grade class. We, along with our travel coordinator NationsClassroom, believe that Washington, DC is the ultimate classroom experience. The students will enjoy experiencing our government first hand when they visit the U.S. Capitol Building, White House and Supreme Court. They will also be inspired by their trips to the Smithsonian museums such as the Air and Space Museum, American History Museum, American Indian Museum, African Art Museum, Natural History Museum and much more. 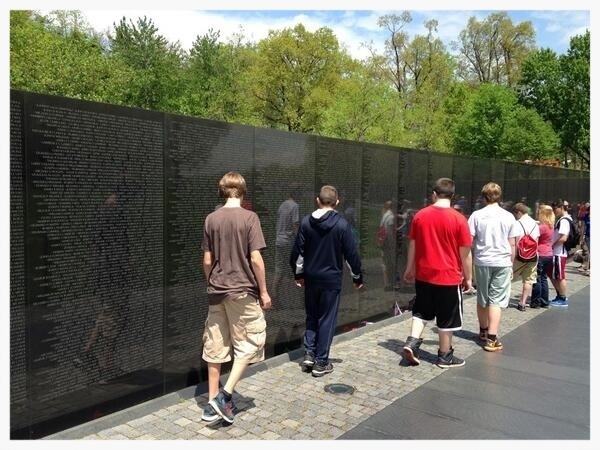 The students will most certainly be awed by the various monuments and memorials including the Jefferson, Lincoln, Iwo Jima, Roosevelt, World War II, Korea, MLK, and Vietnam Memorials. Students’ academic effort, attendance, and behavior throughout the year will determine their eligibility. Any student suspended from school for alcohol, drugs, fighting, insubordination, tobacco, sexual harassment, weapons, or other major handbook violations will NOT be eligible for the trip. Also any student who has been suspended for more than one out-of-school suspension will automatically lose their eligibility for the trip. The final determination for eligibility will be made by the principal. If a student is removed from the trip due to poor behavior in school prior to the trip, they will lose the money put down to pay for the trip unless they purchase trip insurance. The Washington DC trip is chaperoned by Dexter Staff only. We do not have parent chaperones. The one exception is we will take an additional parent/nurse to ensure we have two nurses on the trip. The parent volunteers in charge of the Busch's Fundraiser are: Rebecca Reed rhreed@gmail.com and Nicole Krakowski nataliehmom@hotmail.com. All 8th grade students will have the opportunity to sell pies from Grand Traverse Pie Company during the month of October! For each pie sold, they will earn $5 towards the cost of their trip. For info on this fundraiser, please contact Ms. Straub, the DC coordinator. Parents may arrange for a monthly automatic payment by registering with NationsClassroom. They will then adjust the amount based on student fundraising. The 18-19 school year trip itinerary is in progress! This year, we will be leaving very early (4-5 am) on Monday, April 29 and returning very late on Thursday, May 2 (possibly into the early morning hours of the 3rd). The 16-17 school year trip itineraries are below to give you an idea of how the trip looks for the students.